Time was when Vanessa Redgrave was the brilliant second generation star of the Redgrave clan, and Lynn the talented and delightful kid sister. Vanessa’s lost none of her luster, but watching "Nightingale," Lynn’s one-woman reminiscence of the grandmother she never knew, I was struck, as often before in recent years, by her unique luminosity. Under Joseph Hardy’s direction, she gives a mesmerizing performance. And that in spite of performing nearly the whole show seated behind a table with the script before her, though mind you, she gives it only an occasional glace. Redgrave has said she wrote the piece is in a vulnerable state. After the breakup of her long marriage to John Clark, she sought refuge with her family in England, and one day while walking through a churchyard, came upon her grandmother’s grave, the name sadly obliterated by acid rain. The poignancy of a life lived and possibly forgotten set Redgrave thinking of mortality, and provided the genesis for this play. 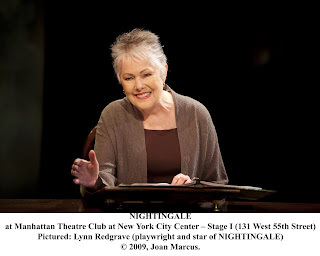 A sort of dual biography, “Nightingale” contrasts the fictionalized life of that grandmother, Beatrice (or Beanie) Kempson, and her own, as a cancer survivor, though the text does seem to presume rather more knowledge of Redgrave’s personal life than every member of the audience will know. Beanie was the rather chilly mother of Redgrave’s own, actress Rachel Kempson. As Redgrave tells it, Beanie had a strict Victorian upbringing, and dutifully married a dullish schools inspector named Eric. Their wedding night was fairly appalling (though it's quite amusing in Redgrave's telling). It was, Redgrave believes, a loveless marriage marked by routine and loneliness, but it produced three children, Nicholas and Robin (Beanie particularly doting on the latter) and Kempson for whom Beanie developed an irrational animosity, one that Redgrave is at a loss to understand. At one point, Beanie and Eric attend a performance of “A Doll’s House” starring Kempson, now Lady Redgrave after her marriage to Sir Michael Redgrave, and Beanie treats her daughter with patronizing contempt. The character would be unrelievedly hateful if Redgrave didn’t also show us the pain of her grandmother’s situation and how she briefly experienced love with a rough hewn farmer when on holiday with her children. She and the farmer went for a ride one day, and – for one exquisite moment -- touched hands, but nothing happened. Redgrave’s tender recounting of what she imagines as the highpoint of Beanie’s life is very special. It’s not clear how much of Redgrave’s detail about her grandmother’s life is true. She has referred to the piece as speculative fiction, and Beanie’s name was not even used in the play’s earlier incarnation at the Mark Taper Forum in L.A. But her delineation of Beanie – however much invented – is absorbing. The parallels Redgrave attempts to make with her own story – such as her own marriage in the 1960’s -- are less successful, but don’t detract from the central narrative. Rui Rita’s lighting helps clarify some of those not always clear transitions from her grandmother’s story to Redgrave’s autobiographical reflections. This is the third time Redgrave has mined her family history but once again, she’s come up with a winner.